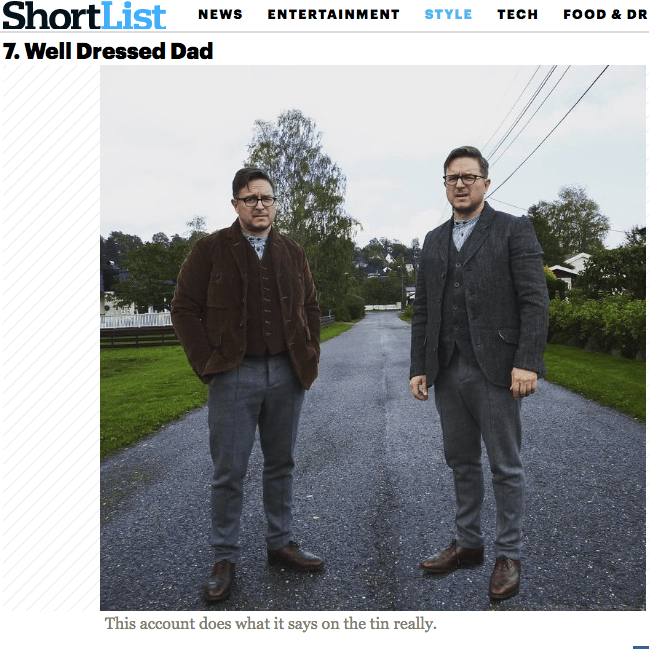 About & contact - Well Dressed Dad - It is a proper menswear blog. Like, with original words and opinions and suchlike. 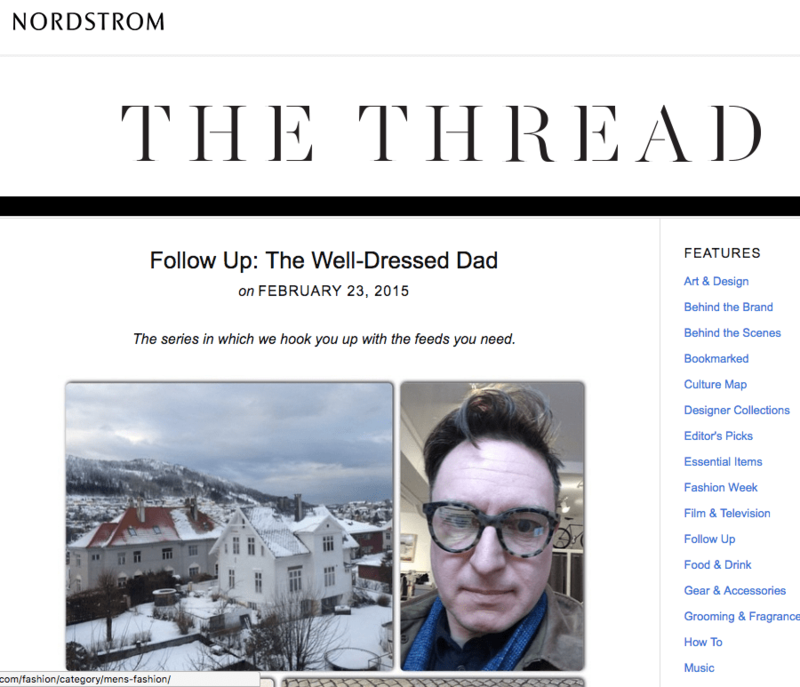 I’m Nick, a middle-aged Norwegian blogger into classic menswear, tweed, workwear and cool things. I specialise in waistcoats, brogues, denim and outerwear. I care about the ethical production of garments, where and how they are made. I am a staunch supporter of the small and individual makers and brands. The blog was started in February 2013. 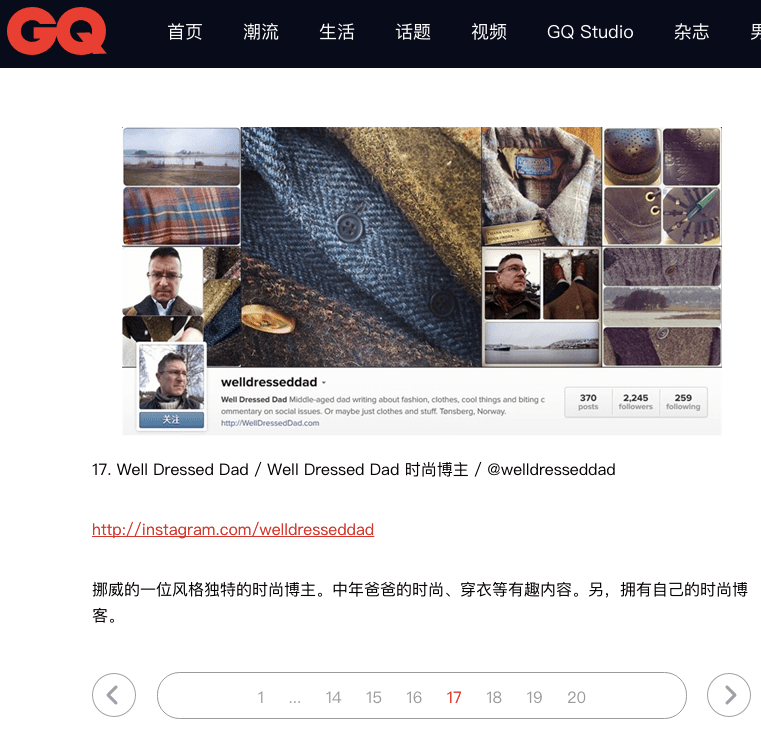 Contact me on WellDressedDad(at)gmail.com, phone or Skype meetings only by prior arrangement. Do you accept guest posts or paid post? No. Would you like to visit us and write about us? Yes, quite probably, but I will require my expenses covered at the very least. My most recent mention was in the Norwegian magazine D2, a supplement to the leading financial newspaper Dagens Næringsliv. As far as I can tell the magazine has a readership of around 250.000. The article can be found here. The Norwegian online magazine Divergent. 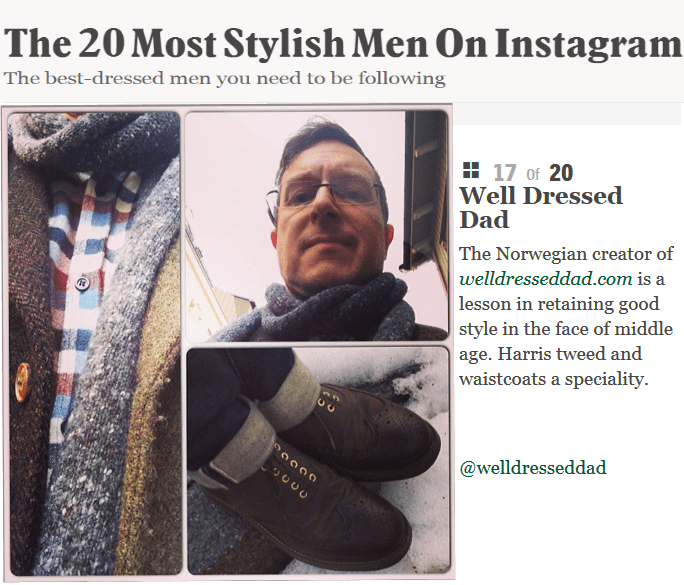 Esquire UK selected me as one of the “20 most stylish men on Instagram” in both 2014 and again in 2016! 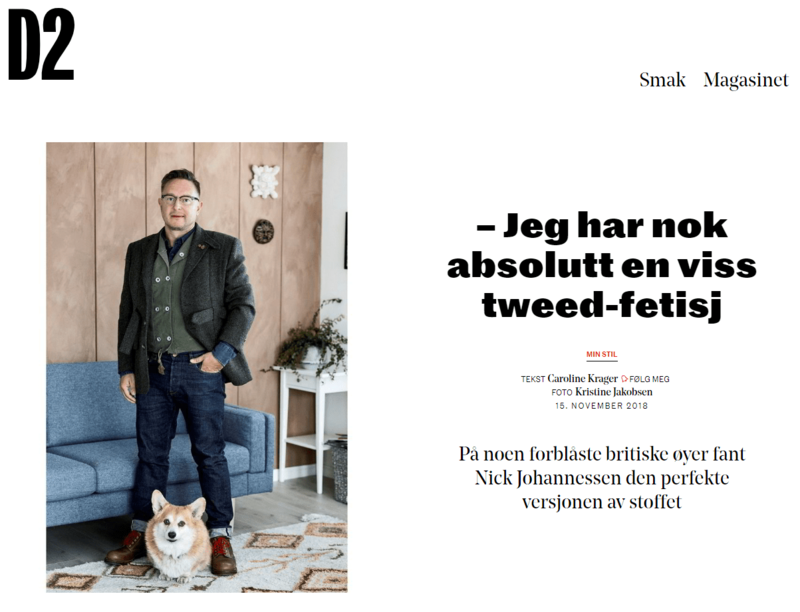 I was also featured in the fashion supplement of the Norwegian newspaper Finansavisen. I was almost on British TV as well, which was almost an interesting experience. 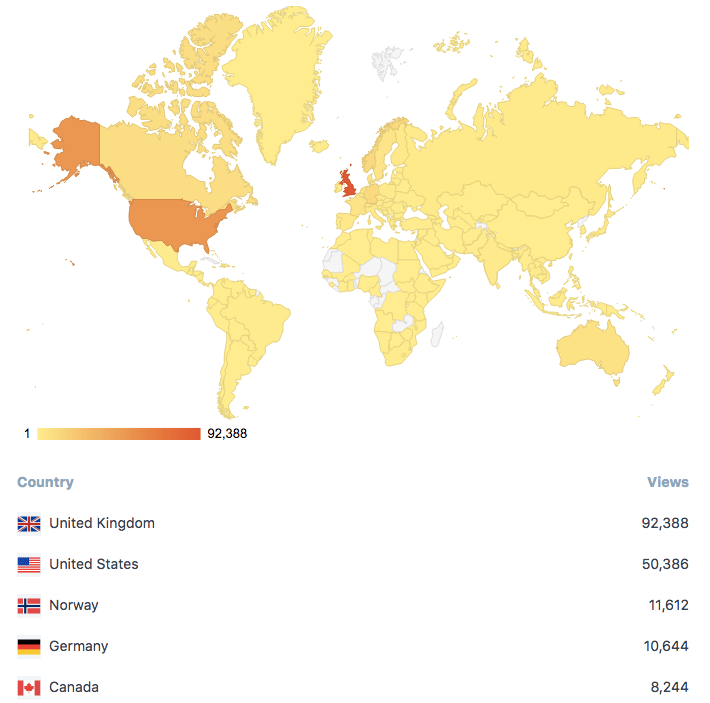 Typical monthly traffic 35.000 page reads by 15.000 readers. I am happy to discuss collaborations, reviews and similar. I was checking your Instagram pictures and found the one about the battle shirt repro. P.s. Thanks for following my me on Instagram I like your stuff too! Thanks for the tip! I’ll see what they say. Nice site. 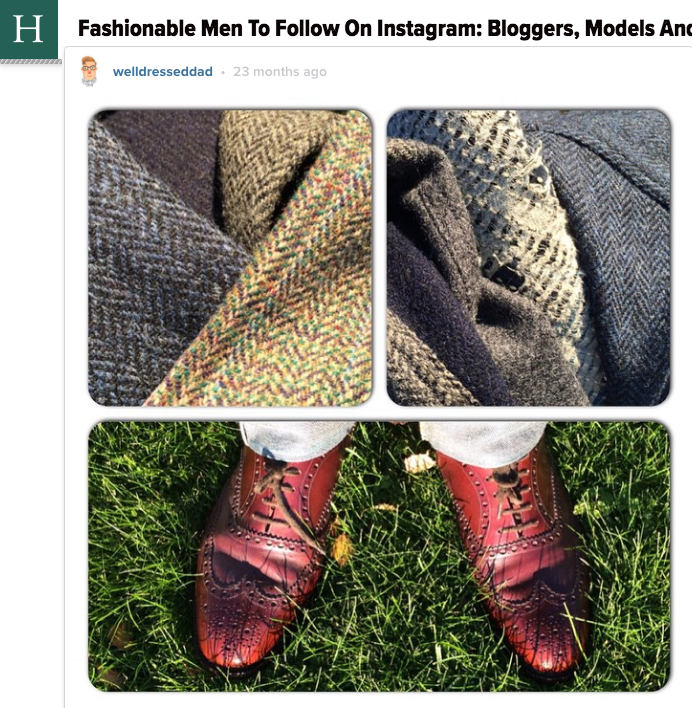 I am a long term Harris Tweed nut (I visited the islands on a youth trip in 1979 – a very long time ago). Stayed with me ever since. Those Swedish army trousers in wool. If you ever run across a pair in W36 L32/33 let me know…! I am new to your blog. Great site! I note that you wear size 52 Nigel Cabourn Mallory waist coats. what size are you please as I am thinking about my chest size usually 44inch circumstance. Second question is what size Mallory tweed coat do you wear if the vest is 52 size.